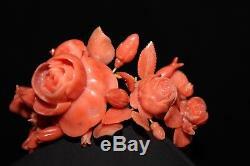 We are offering an Outstanding ANTIQUE VICTORIAN HAND CARVED CORAL ROSES BRACELET 18 K GOLD 70.6 GRAMS! 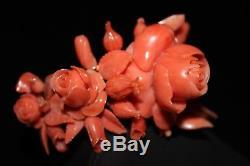 I have never seen such a beautiful coral bracelet in my life. 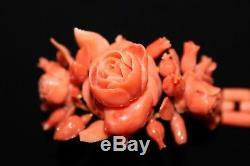 The delicately carved center rose flower, to which all of your attention is drawn, is carved from a big piece of coral, which is very hard to find today. 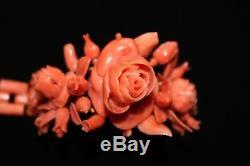 The size of this rose is 37.00 x 30.00 x 21.00 mm. On both sides of the huge center piece two smaller roses are meticulously carved. The roses are surrounded by smaller flower buds and leaves. 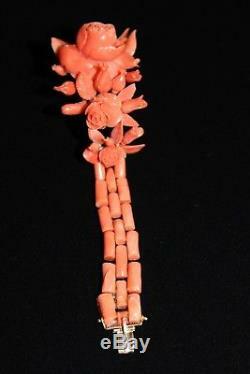 The second part of the bracelet is comprised of 19 rod shaped branches. Each branch measures 13.00 x 6.00 x 6.00 mm. 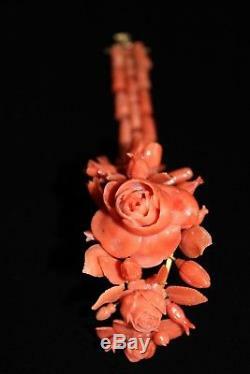 Has 38 carved coral pieces in total plus 19 rod shaped branches. The fine yellow gold base of the bracelet is 18K and is tested. The clasp is in good working order. 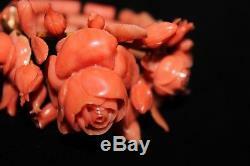 There is a repair near the clasp--six pieces of rod shaped coral have visible glue on them and are no longer flexible. But this does not take away the beauty of the whole bracelet. In Victorian times, this high class coral bracelet belonged to an upper class lady who enjoyed wearing it on special occasions. 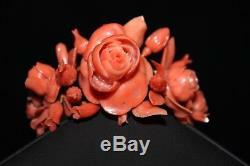 This is truly a one of a kind Victorian coral bracelet that its new owner will sure love to have in their collection. 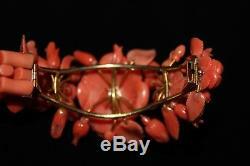 Do not miss this opportunity to own such a rare and valuable coral bracelet! 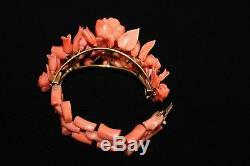 The item "ANTIQUE VICTORIAN HAND CARVED CORAL ROSES BRACELET 18 K GOLD 70.6 GRAMS" is in sale since Thursday, August 16, 2018. 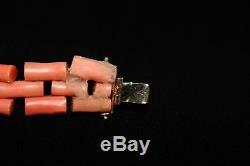 This item is in the category "Jewelry & Watches\Vintage & Antique Jewelry\Costume\Victorian, Edwardian 1837-1910\Bracelets". 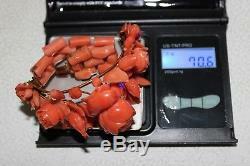 The seller is "sellqualityfast123" and is located in North York, Ontario. This item can be shipped worldwide.